With a shared vision, Gavin Newsom, Gordon Getty and John Conover imagined the addition of a complementary estate vineyard to the valley floor terroir of their Oakville estate at PlumpJack Estate Winery. In 2005, that dream came to fruition in the form of a 54-acre estate, elevated high above the fog line, on the dramatic slopes of Howell Mountain – it would become CADE Estate Winery. Given the opportunity to build the winery from the ground up, Newsom, Getty and Conover were committed to constructing a state-of-the-art winery that would pay tribute to the land, both aesthetically and ecologically. This commitment would go above and beyond the standard benchmark of environmental responsibility, especially in the world of wine. The end goal, to construct the first CCOF (California Certified Organic Farmers) organically farmed, LEED (Leadership in Energy and Environmental Design) Gold Certified Estate Winery in the Napa Valley. Now that the winery construction and operation was planned to reflect these important values, Newsom, Getty and Conover needed to procure an architect with the aptitude to design such a building. They knew that finding someone that shared their vision of environmentally responsibility was vital in their search. 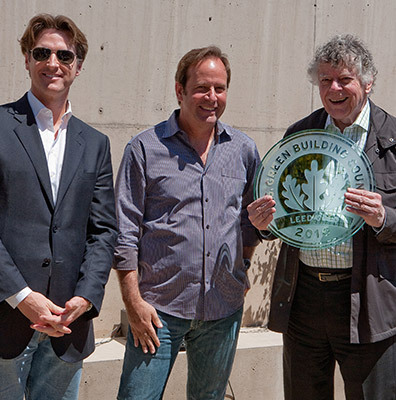 In 2006, they found architect Juan Carlos Fernandez to design Napa Valley’s first LEED Gold Certified Estate Winery. Originally from Guadalajara, Mexico, Fernandez had never designed a winery before but had a plethora of other building design experience throughout the world. Working hand-in-hand with the winemaking team, Fernandez’ goal was to create a state-of-the-art winery whose prominent design would reflect a straightforward, sustainable approach to winemaking while simultaneously honoring their special piece of land on Howell Mountain. Construction began in 2007 and the estate, at an elevation of 1,800 feet, became the canvas of Fernandez’ artistry. Set against a backdrop of staggering Napa Valley vistas, the modern, contemporary design of the winery blended right in with the impressive contrast of the estate, a spot where the organically cultivated vineyard rows were met with tall evergreens and native Manzanita trees. The buildings striking architecture was designed to be a dialogue between gentle contours and strong rectilinear forms, suggesting the complexity of the wines – powerful yet nuanced expressions of the mountain terroir. Every detail of the winery, from the shape of the cellar to the natural insulation of the caves, supports winemaking that brings out the personality of the unique terroir. As an homage to our first winery, the caves at CADE Estate were designed in the shape of the PlumpJack shield. CADE Estate, similar to PlumpJack, also takes its name from Shakespeare, who used the term to refer to the wine casks– or cades– shipped from Bordeaux to England during Elizabethan times. The CADE Estate logo can also trace its inception to the property, where a particular Manzanita tree, rooted in front of the winery building, gave birth to the red tree symbol, both in shape and color. In fact, the path towards the winery is intentionally carved around this special tree, in order to preserve the interplay between natural and architectural spaces. 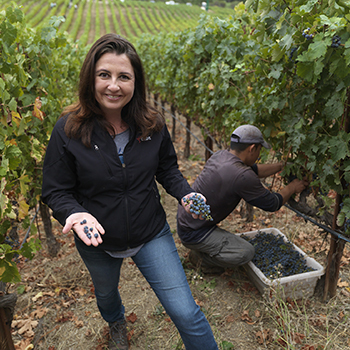 Today, Winemaker Danielle Cyrot continues to craft high elevation cabernet sauvignon that articulates the intense, powerful character of our estate while maintaining a balance of mountain fruit, firm acidity and judicious oak for layered, complex wines that reflect approachability and age ability – this nuanced, artisanal expression that we refer to as Modern Howell Mountain.